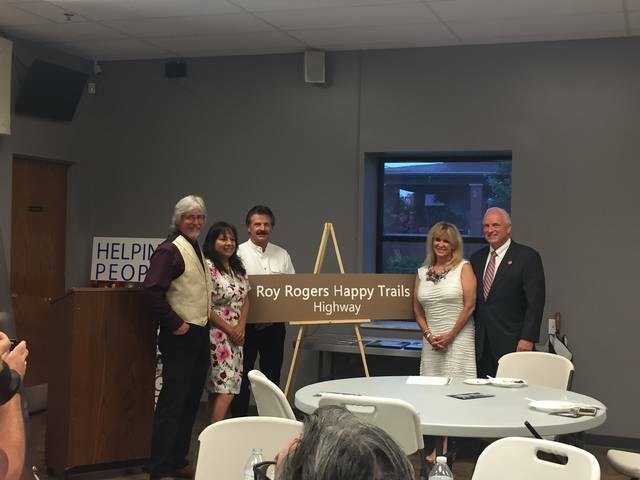 The Roy Rogers Happy Trails highway sign was unveiled Tuesday morning. Pictured at the unveiling are from left: John Patterson, Dodie Rogers Patterson (Daughter of Rogers), Gino Pomilia, Julie Pomilia (grandaughter of Rogers), and 90th District State Representative Dr. Terry Johnson. Dr, Aaron Adams, second from left, accepted his Roy Rogers Character Award Wednesday morning. Pictured from left are Dodie Rogers Patterson, Adams and 90th District State Representative Dr. Terry Johnson. 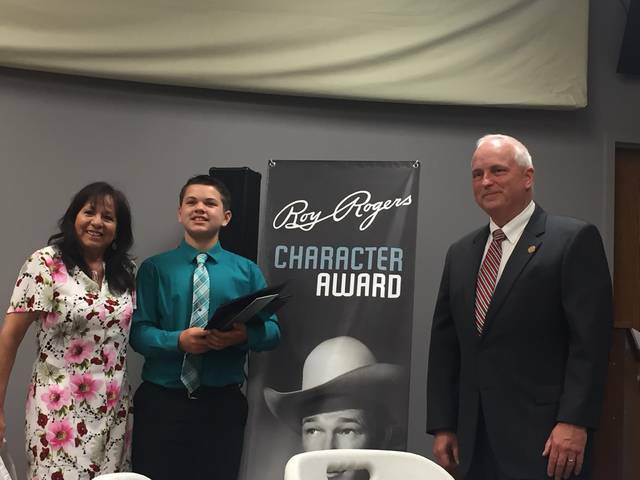 Accepting the youth award for the Roy Rogers Character Awards was Pierce C Banks. Presenting the award was Dodie Rogers Patterson, left, and 90th District State Representative Dr. Terry Johnson, far right. 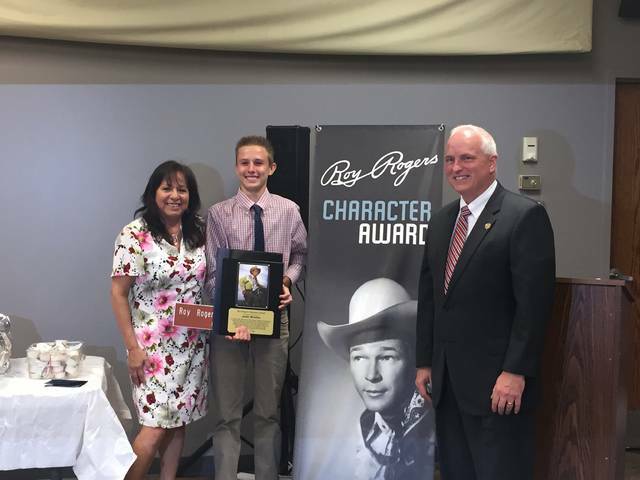 Accepting the Roy Rogers Teen Character Award was Josh Wiehle. Presenting the award was Dodie Rogers Patterson left, and 90th District State Representative Dr. Terry Johnson, far right. 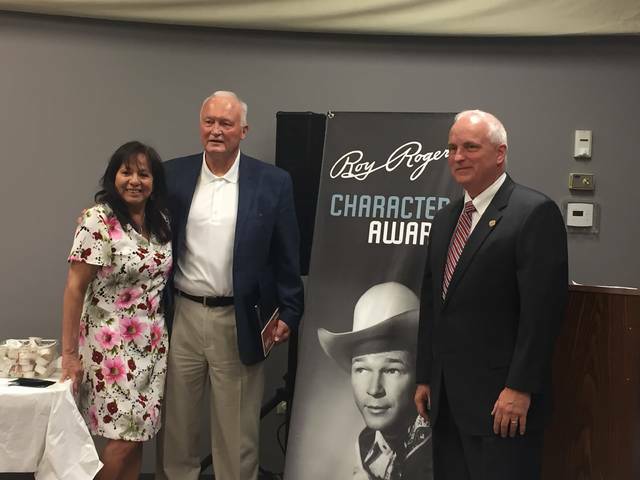 Dodie Rogers Patterson talked briefly Wednesday morning about her father at the the Roy Rogers Character Award Breakfast, call Scioto County her “second home.” Rogers said a lot of her father’s character was built while growing up on Duck Run as a child. Rogers went on to star on television and the big screen in the 1940s through 1960s, playing in roles as “King of the Cowboys.” Those speaking about Rogers at the kickoff event for the 35th Annual Roy Rogers Festival said although he played a gun slinging cowboy in the movies, Rogers was the exact opposite in real life. Johnson presented the unveiling of an Ohio Department of Transportation sign depicting SR 348 from SR 104 to as Johnson described, halfway to Otway, as the “Roy Rogers Happy Trail Highway.” Johnson said it was fitting since this area was where Rogers grew up. Johnson said there has been a lot of people from Southern Ohio to make a national impact since Rogers blazed the trail to Hollywood, mentioning names like Branch Rickey, Al Oliver, and Gene Tenace. Oliver was in attendance at the event. In addition to Patterson, Roger’s granddaughter Julie Rogers Pomilia was available as well. Along with their husbands. Patterson’s husband, Jon, a NASA Scientist, led the crowd in saying the Pledge of Allegiance, as well as leading the singing of the National Anthem to start the morning. The awards ceremony consisted of three awards. Accepting the Youth Award was Pierce C. Banks; the teen award was given to Justin Wiehle. The adult award went to Dr. Aaron Adams. Stars attending the meeting was Robert Carridine of Revenge of the Nerds fame and John Duelly, who played Billy The Kid. Other stars are expected to attend the festival throughout the weekend. https://www.portsmouth-dailytimes.com/wp-content/uploads/sites/28/2018/08/web1_Adams.jpgThe Roy Rogers Happy Trails highway sign was unveiled Tuesday morning. Pictured at the unveiling are from left: John Patterson, Dodie Rogers Patterson (Daughter of Rogers), Gino Pomilia, Julie Pomilia (grandaughter of Rogers), and 90th District State Representative Dr. Terry Johnson. Dr, Aaron Adams, second from left, accepted his Roy Rogers Character Award Wednesday morning. Pictured from left are Dodie Rogers Patterson, Adams and 90th District State Representative Dr. Terry Johnson. https://www.portsmouth-dailytimes.com/wp-content/uploads/sites/28/2018/08/web1_Youth.jpgAccepting the youth award for the Roy Rogers Character Awards was Pierce C Banks. Presenting the award was Dodie Rogers Patterson, left, and 90th District State Representative Dr. Terry Johnson, far right. https://www.portsmouth-dailytimes.com/wp-content/uploads/sites/28/2018/08/web1_Teen.jpgAccepting the Roy Rogers Teen Character Award was Josh Wiehle. Presenting the award was Dodie Rogers Patterson left, and 90th District State Representative Dr. Terry Johnson, far right.